You might have noticed a book in the hands of Trax riders and sticking out of bags and pockets around town—a distinctive cover featuring a red paper crane balanced on a person's cupped hands. Is it the "it book" of the moment—the next Twilight, maybe? Well, sort of. The book is When the Emperor Was Divine by Julie Otsuka, and more than 1,500 copies of the slim novel have been passed out by the Salt Lake City Public Library as part of the Big Read, a national program designed to bring communities together through a shared experience. 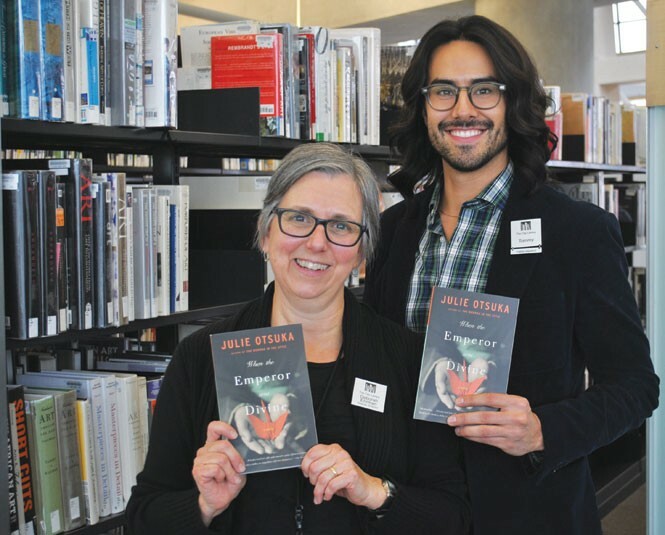 The library's deputy director, Debbie Ehrman, and its adult-services coordinator, Tommy Hamby (both pictured), say the title was chosen for Utah's program because of what it means to be an American citizen, and the balance between national freedom and fear. The Big Read goes through June, with related exhibits and discussions happening at the library, online and at locations across the state—currently, When Words Weren't Enough: Works on Paper from Topaz, 1942-1945 is showing at the Topaz Museum in Delta, Utah, the location of the Japanese internment camp that's the setting of When the Emperor Was Divine. Visit SLCPL.org/bigread for more information. How did you choose this book for The Big Read? Debbie Ehrman: I had read the book years ago and was really moved by it. [Otsuka] has such a spare style, but she packs a lot of emotion into it. Not that her characters are that emotional, but what they're going through really resonated with me. I might have pushed it on the staff. And of course, there's the Utah tie. Tommy Hamby: And I think it's something that a junior high kid could read and get meaning from. It's a powerful book. Why should the community read together? D.E. : People have an opportunity to share ideas. Books always have interesting stories or ideas, and this book in particular is important for Utah audiences because Topaz was so close, in Delta. It's part of Utah's history during World War II. There are a lot of people in the community who were either housed in Topaz, or knew people who were, or were at other internment camps throughout the West. Are internment camps a lesser-known aspect of World War II? D.E. : You kind of have your history book, what you learned in school. I grew up in Ohio, and I don't have any clear remembrance of ever learning about internment camps. But it relates so much to today ... You're thinking you're not so much "an other," because you've adopted so many American views. You love the same radio shows and same music, and then all of a sudden, it's your "otherness" that's so defining. Otsuka's grandmother may have gone through this experience. I don't think her grandmother really spoke about it; [Julie] sort of pieced it together. And that's often true. Some families don't talk about those experience because it's like, "It's behind us." How is this different from a regular book club? D.E. : We had the opportunity to bring Julie Otsuka here. How often do you get to meet the author of the book you're reading? What do you think of the stats that show people don't read once they leave school? D.E. : Maybe people don't read, but maybe they view or listen. That's also a way to be connected to what's out there in arts or culture. This newer generation of people is reading more. Maybe it's not in book form, but there's reading going on. Is the library adapting to the ways people consume information? D: It's a place where people get excited to come in and learn something new. It's just evolved over all these years. It's always been a place for people to gather, but I think people are gathering more here, and our role has become more to facilitate those gatherings, still provide those materials, but we help them navigate ... not so much hold all this knowledge in our heads, like, "Well, let me show you how to use the reader's guide to periodical literature." Now, people have these things at their fingertips, but we can help connect them to some of these resources. And that, to me, is the really fun part. What's the next step for people who are really jazzed about reading as a group? DE: We have staff on-hand who can talk to people who want to set up a book group; we have cool resources, databases that can help. If you're in a regular book club and you're picking books, we have a great database called Novelist that has [discussion] questions on a lot of books. T: Book clubs are a way to bring people together, and we're all about that.